There is a lot to like about the Joie Nitro umbrella stroller: it folds up easily, looks great, is good value and it has a higher than normal weight limit. Available in different colours I chose the pink or magenta, but I would call it more of a purple. 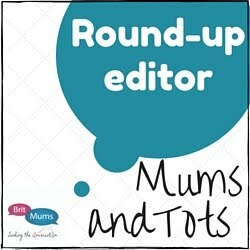 While there are a few minor aspects I think could be improved it is a great pushchair and it has been fun to review. What age is the Joie Nitro suitable for? The first thing that interested me about the Joie Nitro stroller is that it has been tested to 22.5kg. This is much more than the standard for pushchairs of around 15kg. This is great if you have a heavier toddler or if, like me, you have an older child who occasionally has meltdowns because she too wants to go in the pushchair. At 6 years old my eldest is coming to the tested weight limit of this pushchair and while I wouldn’t advocate regularly pushing around school age children there are definitely times it would come in handy, like when she had a kidney infection and couldn’t walk. 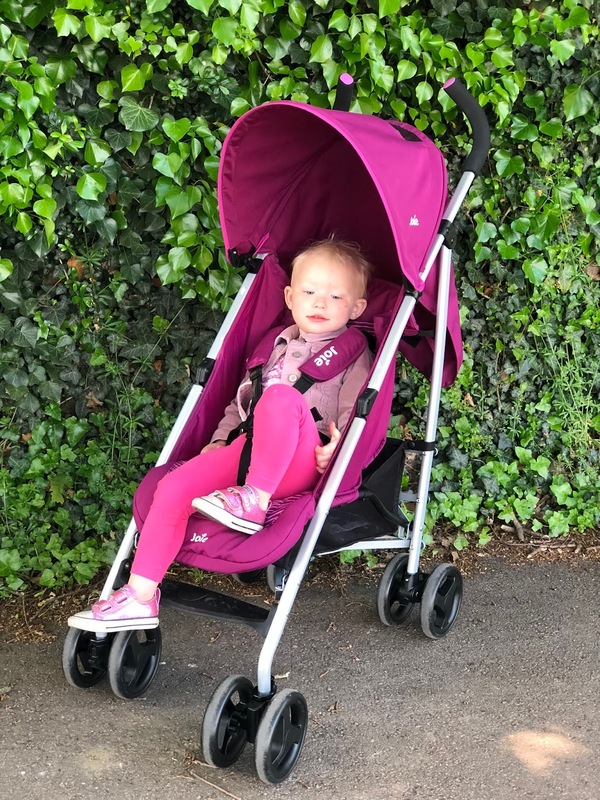 She was also regularly taken to and from preschool in a pushchair because a 30 minute walk after 10 hours a preschool could be a little much for her at 4 years old. 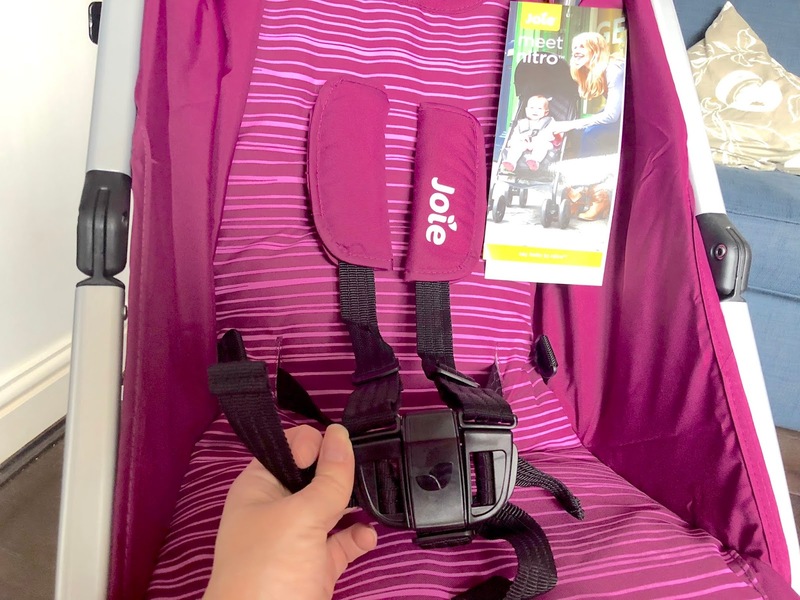 The Joie Nitro is suitable for use with newborn babies as it fully reclines by pulling the lever on the back of the seat and pushing the seat back down. 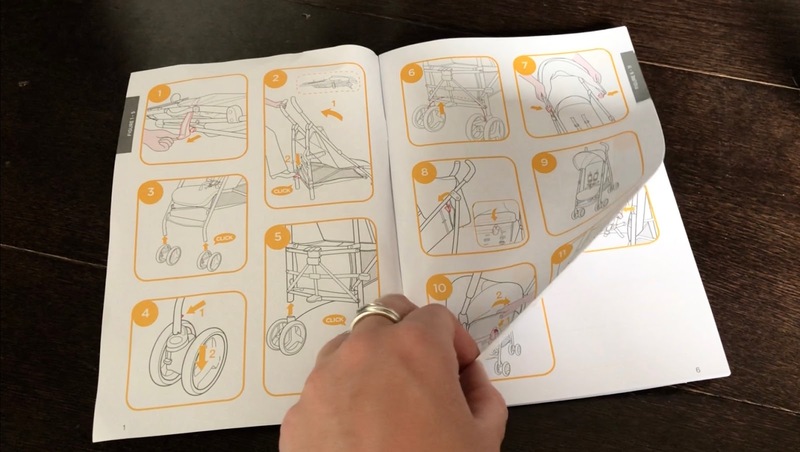 I personally wouldn’t choose to use this sort of stroller regularly with a newborn, but that's only because I prefer to babywear or to use one with some form of carry cot or cocoon, but if you are on a budget you could manage with just this pushchair. What Size Is The Joie Nitro? 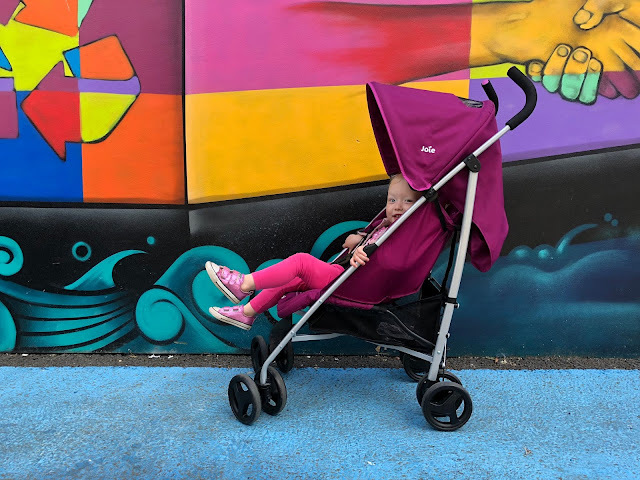 Like most (if not all) umbrella strollers the Joie Nitro has fixed height handle bars, but the design makes it more comfortable for a wider than normal height range. You can hold the handles in a few positions depending on height and at 108 cms tall it reaches a little taller than my previous pushchair. The height is partly due to having good size wheels for this type of pushchair. 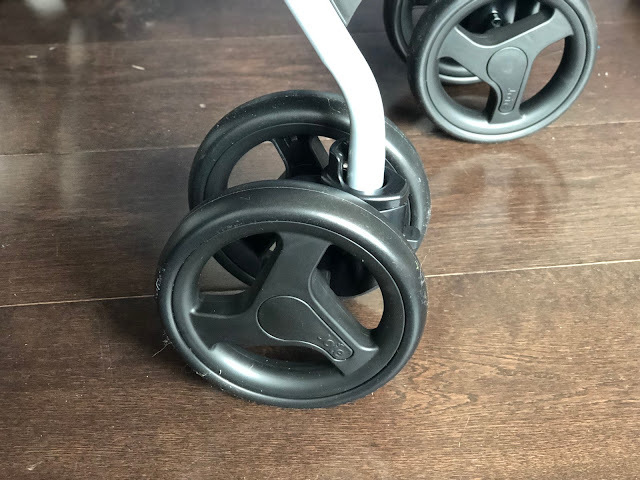 The wheels all have , suspension for a “smoother ride” and the front wheels can be locked into place (I have never found it easy to use pushchairs with fixed front wheels, but apparently it can be useful in icy weather). When folded the pushchair is about 109.5 cms long and only just fits boot of my Ford Fiesta. The basket under the seat is made from a light material, but it goes all the way under the seat so it's quite a good size. You could easily get a coat, lunchbox, water bottle and a few toys in there. The Joie Nitro needs some assembly before use which is quick to do. Just push on the wheels and canopy and you are good to go. 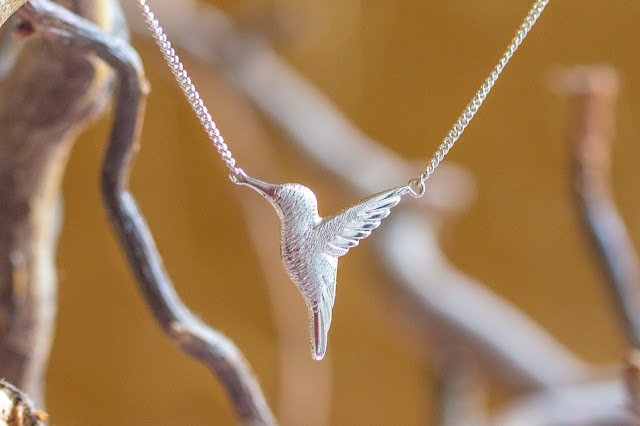 These can also be removed fairly easily if required. There are instructions using both words and pictures making it easy to assemble. If you are an ignore-the-instructions-completely sort of person you should find it straight forward too. How Easy Is The Joie Nitro To Use? The Joie Nitro is easy to push and steer even one handed and gives a smooth ride for this sort of pushchair. It is easy to fold with good size levers which are easy to find and lift/ push. In fact there are two leavers in the middle, a higher up one which is more comfortable for your fingers, and one lower down more comfortable to use with your feet. To close you lift a middle leaver up and push the leaver on the side of the pushchair down and the pushchair folds forwards. 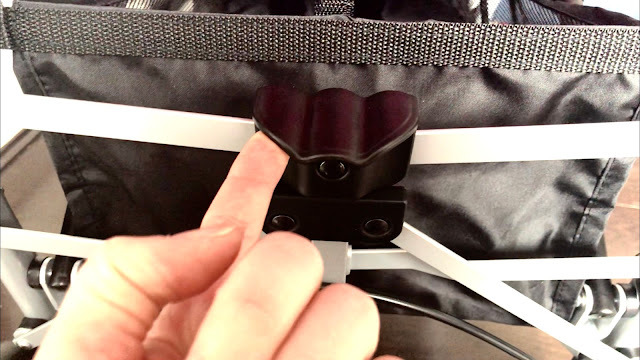 A clip on the side keeps the pushchair shut and there is a handle on the side to allow for easy lifting (it weighs a reasonable 7.52kg). To open the pushchair you need to undo the clip on the side, pull the handle bars up and then push on the middle lever until it clicks. As it opens and closes in a similar way to other umbrella strollers people should find this easy to use. The break is a reasonable size leaver on the back right wheel. Previous pushchairs I have used have had the break in the middle of the pushchair and quite close to the ground. Somehow my partner always manages to step on it and partially turn the break on while walking. This isn’t a problem with the location of the break on the Joie Nitro. If, like me, you put your changing bag over the handles of your pushchair you will probably be familiar with the tendency of pushchairs to fall over backwards once the child is removed. With the Joie Nitro the seat is connected to handles lower down than my Maclaren which lowers the centre of gravity and makes it less likely to tip over. Don’t underestimate how useful this is when your child is at an age where they keep wanting to hop in and out of the pushchair. The straps are easy to adjust. There are 3 height settings which can be adjusted by pushing the end of the straps through the slot at the back. You can also shorten the length of shoulder, waist and between the leg straps. I like that you buckle each side of the strap in separately as this can be easier when wrestling a reluctant octopus into a pushchair and it is easy to unbuckle for even people with limited mobility in their fingers, you just press the Joie symbol on the front to open. 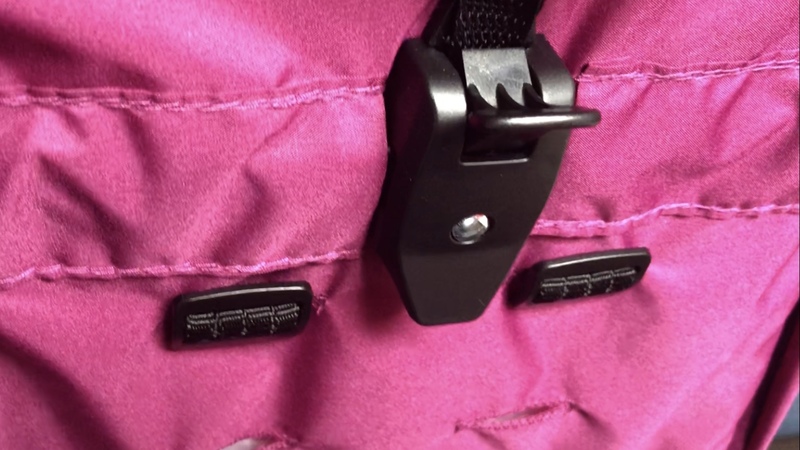 There is also the option to use the waist and between the leg strap without the shoulder ones as these unclip. For the price this pushchair has a lot going for it, but if I was going to be really picky there are a few things I would love to see improved. The canopy is quite small and doesn’t provide a lot of shade from the sun (although what fabric is there is UPF 50+), an additional sun shade like the Snoozeshade might be a useful purchase. There is also a small viewing window in the hood which is a nice idea, but I find this pretty difficult to see much through so it’s of limited use. At 28 months and 90 cms tall Little’s head is partially off the back of the seat. Given the weight limit is so high it would benefit a higher backed seat. The hood is much higher though so you can keep the hood on until the child no longer needs to use the pushchair. 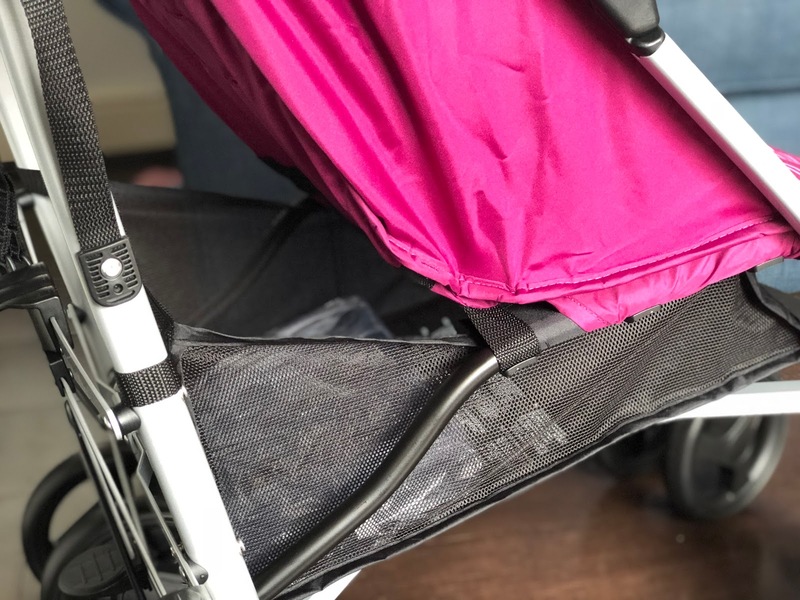 It comes with a rain cover which nicely fits in the bottom of the pushchair and doesn't stop the pushchair closing properly, but the cover isn't very long. Once the child's feet go beyond the end of the seat the rain cover wont protect them. It also doesn't provide any protection for the back of the pushchair (mostly an issue if the seat is fully reclined) or the basket. The seat and covers aren't removable for washing (it's always great when you can just chuck them in the washing machine), but you would be able to sponge clean them in situ. 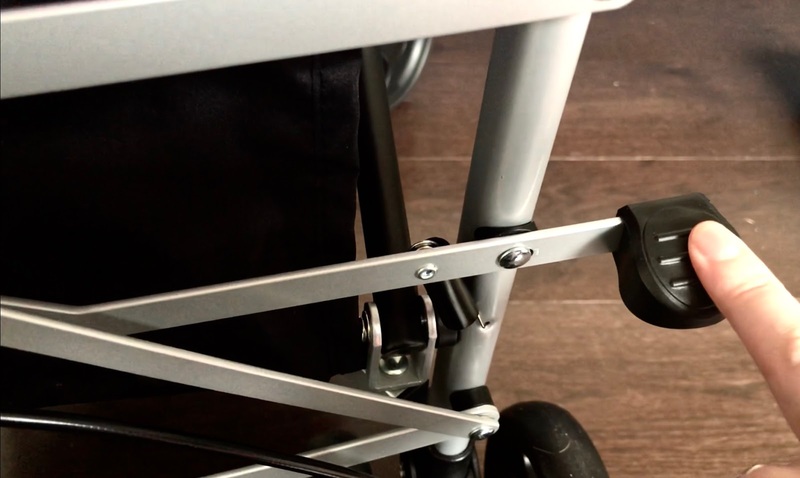 The calf support can be pushed down to make it more comfortable for growing children, but annoyingly it goes back to it's default position every time you close the pushchair. Fortunately it is really quick to adjust again. None of these issues are a big concern to me and I will happily keep on using the pushchair. The Joie Nitro skewed lines is currently £69.95 with free delivery from Kiddies Kingdom.